Islam Around Us: Iraq mosque blasts kill 16 people. Iraq | AFP | 21 Sep 2013 :: Two bombs exploded in a Sunni mosque in Iraq as worshippers entered for prayers on Friday, killing 16 people, police and a doctor said. The bombs, which hit the Musab bin Omair mosque near Samarra, north of Baghdad, also wounded 15 people, the sources said. 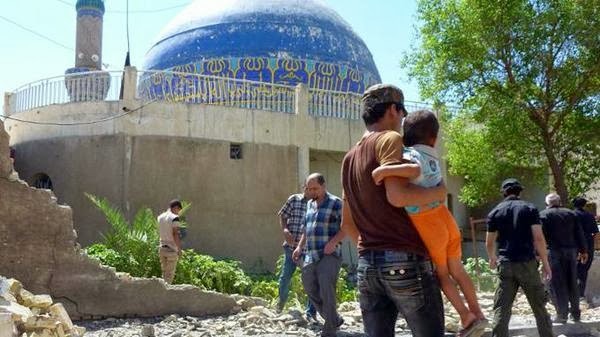 Militants have carried out numerous attacks on both Sunni and Shiite mosques this year, raising fears of a return to all-out sectarian conflict, which peaked in 2006-2007 and killed thousands of people. The February 2006 bombing of a Shiite shrine in Samarra itself sparked the wave of brutal violence. The blasts came a day after the bodies of 10 young men who had been shot dead were found in Baghdad, another reminder of the sectarian conflict in Iraq, during which militants frequently carried out summary executions.